These five training tips will help you shed that dangerous spare tyre. Belly fat is bad news. While researchers debate the real health risks of a higher body mass index (BMI) or carrying a few extra kilos, everyone agrees that wearing too much weight around your waist is largely detrimental to your health. Research shows that a waistline over 101cm for men and 88cm for women puts you at risk for heart disease even if you’re not technically overweight and otherwise in good health. Belly fat has also been linked to high blood pressure, high cholesterol, high blood sugar and diabetes. Again, bad news. 1. Go hard to lose belly fat. •Pick up your effort so you’re working hard (a nine on a One-to-10 scale; you’re breathing hard, but not gasping) for 30 seconds to one minute. •Go easy for one minute. •Repeat a total of five times. •Cool down for two to three minutes. 2. Keep it controlled and comfortable. Yes. We just told you to go hard to burn off unwanted belly fat—but don’t overdo it. Going hard all the timestresses your body and leaves you chronically inflamed, which can backfire by contributing to belly-fat storage. Cap the intensity to a couple times a week and take the rest of your weekly rides at a controlled, comfortable pace. “Most recreational cyclists are doing too much high intensity training and they’re not getting leaner or faster,” says Iñigo San Millán, PhD, the director of the Exercise Physiology and Human Performance Lab at the University of Colorado School of Medicine. “Many of your rides should be in Zone 2,” he says. That’s an intensity where you can talk the whole time – about a five to six on that One-to-10 scale. “This is usually the intensity that elicits the highest fat oxidation for energy purposes,” says San Millán. 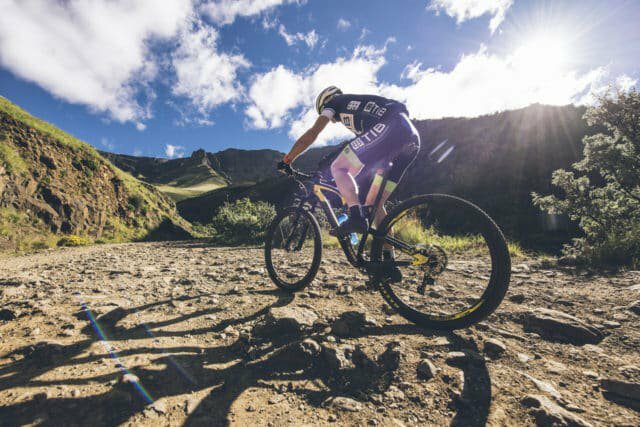 These rides are not only good for burning fat, but also for building your slow-twitch, endurance muscle fibres; increasing capillary development; improving your ability to use lactate for energy; and making you a better fat-burner all the way around. 3. Aim for about 80/20. A number of coaches prescribe what is known as the “80/20 rule,” also called polarised training, for balancing training intensity. It’s definitely worth a try for burning off belly fat as well as for getting fitter and faster. The goal is to spend 80 per cent of riding time at low intensity and 20 per cent at moderate to hard intensity. That way, when it’s time to go hard, you have the freshness and energy reserves to go hard enough to maximise those interval efforts. Hitting both intensities actually improves your abilities all around: Your slow-twitch muscle fibres do the work of recycling the lactate your high-intensity, fast-twitch fibres produce. so when you spend time building them, the payoff is being able to work harder at high intensity – which in turn stimulates more fat burning. Research shows this intensity combo also makes you faster. In a 2013 study published in the Journal of Applied Physiology, researchers found that when cyclists performed six weeks of 80/20-style training, they more than doubled their power and performance gains, such as lactate threshold, compared to when they spent more time in moderate training zones. If you’re riding for more than two hours, take food with you – the goal isn’t to bonk – and begin eating at the 2-hour mark. Fasted riding is a tried and true way to help your body burn more fat. It’s easiest to do before breakfast after you’ve fasted all night long and your glycogen stores are low, so your body needs to tap into fat for fuel. Even small bike trips deliver fat-burning benefits over time. A study published in the Journal of Epidemiology & Community Health reported that people who started commuting by bike for as little as 10 minutes each way lost a couple of kilograms and improved their BMIs over a span of two years. Those whose commutes were at least 30 minutes each way saw significant weight and BMI improvements, losing about 6kg and reducing their BMIs and average of 2.25 points over the same time period.